B-wave lows are where you want to BUY. 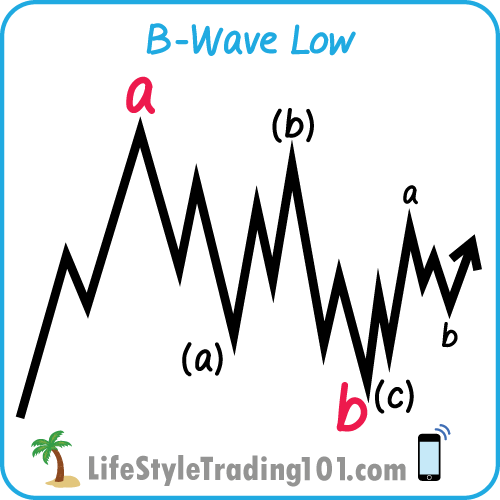 B-wave lows follow after a-wave pops and can potentially retest lows. B-waves are important, because they are generally the best areas to buy with stops at the prior 5th wave lows. They can also be a series of a-b-c’s — with lots of fake 1-2-3 setups – where it never breaks out – but instead constantly makes new lows, frustrating dip buyers. Circled in blue above is what appears to be a b-wave after a completed 5-wave pattern. Notice the bottom of the prior 3rd wave can serve as a visual guide as to where the low of the b-wave would go. Usually the b-wave would exceed that low by a little bit. The above chart is on a Friday. Any dip-buyers looking for an opportunity to buy would be frustrated – especially if they put stops at the immediate prior lows. Each stop will just keep getting hit as new lows are made multiple times. Even after the close at 4pm — it made a low lower than the previous low of 1138. At 9:30am – the wave 1 down of the b-wave began. And the bottom of the b-wave did not finish until 11:30am for the S&P. Even in smaller time frames – you would see the A-B-1-2-3-4-5 pattern repeat over and over.